You don't go to Dubai to look at the greenery. You do go, however, for the hotels (some of the best in the world) and the service (ditto). And as a pampering stopover, you can't really go far wrong. Choose from some of the finest hotels that money can buy. And a few that money can't. The evolution of Dubai from wasteland to playground has been hectic and shows no sign of abating. The effects of the war on Iraq has been noticeable though - and visitor figures are down. Bu they will return. In when they do they will find the world's tallest hotel, the man made palm islands stretching far into the water, shopping mall after shopping mall and a new marine park. In fact now is probably a good time to go, as you'll find a less frenetic pace about the place, before the tourist hordes return. 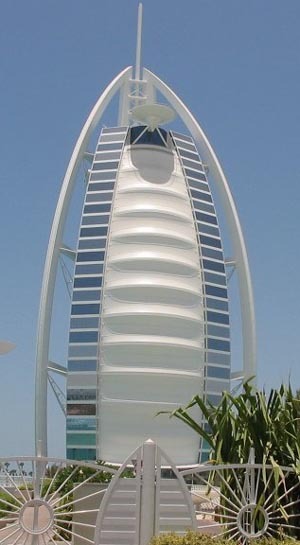 For a good overview of Dubai, try this link.